The start to the Men’s Downhill on the approximately 3 km long Corviglia run is the sporting highlight of the Ski Championships 2017. With a gradient of 45 degrees, the steepest start in the world feels practically like a vertical fall from a great height. Even the way up to the start is adventurous: a staircase of 187 steel steps leads up to an altitude of 2840 meters. When looking down from the start, the pulse of any racer shoots up to 120. From here the athletes accelerate in a few seconds to around 140 km/h – faster than many racing cars. This speed is reached down a gradient of 100 percent or 45 degrees. The first 150 meters are almost vertical and convey the feeling of a free fall to the racers. This breathtaking start has consequently been named ‘Free Fall’, giving the Pista Corviglia on the local mountain of St. Moritz its distinctive feature. Nowhere else do skiers hurtle down such a steep rocky slope from a great height – the start to the downhill competition has become a myth on the ski circuit. Hochfilzen, located at the heart of Tirol’s Pillerseetal Valley, is busy preparing for hosting the Biathlon Worlds from February 08 to 19, 2017. No expense has been spared in a series of 20 million-euro investment projects that have seen the creation of a brand-new sporting venue and the upgrade of existing biathlon infrastructure, including an indoor shooting range, paved roller ski trails, and new spectator stands. The organizers of the 2017 BMW IBU World Championships Biathlon look forward to adding this year’s events to the Hochfilzen Biathlon Center’s legacy of successful sport competitions. 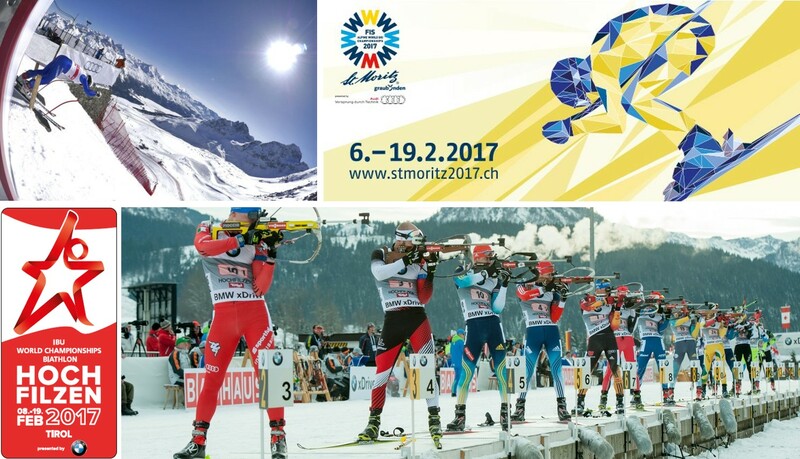 After 1978 and 2005, 2017 will mark the third time that Tirol will host this momentous international event. Nitro consists of a double expando A unit (recommended working area is 64×24 feet) that will house the main production team and then a non-expanding B unit that will have a production team focused on the in-venue production, an audio submix area, and the equivalent of a master control area for play out of previously recorded events. Previously those activities required two separate trucks. The A unit includes a Grass Valley Kayenne K-Frame production switcher, Calrec Artemis audio console, Evertz EQX baseband video router and Evertz EMR audio router, Boland video monitors (in both units), EVS XT replay servers and Sony HDC-2500 cameras. Tupelo-Honey Raycom and WebStream Sports will combine resources and be known as Tupelo Raycom, effective immediately. The sports and entertainment company will continue to operate offices in New York City, Indianapolis, Charlotte and Nashville. The first program to bear the new Tupelo Raycom production credit, “Holiday Homecoming with Jewel” aired on CBS Christmas Day. Tupelo-Honey produces mid-level events in four sectors: Sports, Live, Entertainment, and Digital. In the sports sector, Tupelo produces college football, college basketball, and other programming for NBCSN, ESPN, and other broadcasters and is the exclusive production company for national Arena Football League broadcasts on CBS Sports Network and ESPN2. HD Broadcast, a German provider of live production and outside broadcasting (OB) services, has upgraded its HD1 mobile production truck with Riedel Communications' MediorNet real-time network. Three MediorNet Compact Pro frames and six Riedel MicroN high-density media distribution network devices are connected over a 10 Gbps optical fiber network to create a fully redundant, decentralized routing matrix. Working in combination with HD Broadcast's existing Riedel Artist digital matrix intercom system, the highly scalable new MediorNet infrastructure combines fully integrated signal transport, routing, and processing with pristine communications. 42Live runs 2 Uplink Trucks based around LiveU, Ka-Sat and 4G and also has quick deploy of LiveU LU500 Back Packs. Technical details of the two available vanss are listed below. We cover UK Locations or even come into Europe. 42Live can mix up to 10 HD SDI camera inputs but really only work around 2, 1 cabled up to 300 meters usually on fibre and one on a Cobham WiFi link. Full radio comms between OB Truck and camera operators are available. Relay messages with IFB via LiveU, VOIP or mobile are standard. Each truck has editing capability. Current clients include, BBC, Sky News, EuroSport and others. Both trucks have been setup for high definition broadcasting, web streaming and as a remote internet provision. NEP The Netherlands provides the complete technology for the Ziggo Sport channels, with an end-to-end workflow developed by NEP and built in-house. This solution seamlessly fits Ziggo’s workflow and includes teleport, MCR, studios, Cloud Production, live and post production facilities and offices. Ziggo Sport is located in NEP Studio 11, in the heart of the Hilversum Media Park. Last May Liberty Global, the parent company of Ziggo Sport, selected NEP The Netherlands to build, operate and maintain the complete playout and technical production for the open Ziggo Sport channel. TV Azteca, the second largest mass media company in Mexico, has invested in Robe Pointe moving lights which were specified by Head of Lighting Miguel Osorno and Lighting Manager Manolo Toledo. The fixtures reside at TV Azteca’s main broadcast complex in Ajusco in the south of Mexico City which has 7 studios and are used there and on another 11 studios at their other main site across the city in Tlalpan. TV Azteca broadcasts two networks – Azteca 7 and Azteca Trece - and 10 cable channels covering a wide mix of programmes, including news, soaps, quiz shows, music, reality, etc. Lighting for all the programmes utilizing the studios is designed and co-ordinated by Manolo and Miguel – the department is working 7 days a week - and there are outside broadcasts on top of that. Since first going on air in 1954, independent television station WAPA-TV (Channel 4) in San Juan, Puerto Rico, has been a technology leader among broadcast stations in the island country. In 2016, WAPA-TV renovated its broadcast lighting in three of its studios, installing Elation TVL™ series LED lighting systems. Installation of the white light luminaires made WAPA-TV the first broadcast studio in Puerto Rico to transition to LED technology. WAPA-TV replaced all of its conventional fixtures with LED in its largest studio (Cinema), as well as a separate broadcast studio plus a smaller studio. Since 1913, the American Cancer Society (ACS) has been focused on using the latest technologies, not only in the research laboratory, but also in how it communicates lifesaving information to the public. Equipped with NewTek’s TriCaster® 8000 multi-camera video production system and TalkShow® VS 100 Skype for broadcast solution, ACS not only produces and broadcasts wellness and lifesaving programing from its in-house studio, it’s also positioned to cost-effectively live-stream content from events both nationwide and worldwide. Relay For Life is ACS’s signature fundraising event that takes place at over 5,000 separate venues in 20 countries around the world. Once again LMC LiveMotionConcept supplied multiple Antelope UltraSlowMotion Cameras at the most prestigious Alpine Skiing Event. ORF Austrian Television with director Michael Koegler was in charge of the World Feed of the 77. edition of the world famous Hahnenkamm Race in Kitzbuehel, Tyrolia. Since 1931 the Hahnenkamm Races have taken place at the Kitzbuehel Hausberg mountain on Streif and Ganslernhang. Where only a highspeed camera can show the dynamics of the hellhounds chasing down one of the fastest skiing slopes all replay operations as well as the engineering were handled by LMC staff out of two mobile production vehicles connected to the World Feed OB Truck from ORF Austrian Television. The 2017 IHF Men’s Handball World Championships in France will probably be the fairest competitions ever when it comes to referee decisions. During the World Championships German System Integration Company Broadcast Solutions GmbH provides the technology for the video support of the referees with several videoReferee® systems. Together with technology provider Slomo.tv, all of the competition venues will be equipped with the videoReferee ® video judging systems and will be supported by Broadcast Solutions during the tournament. The videoReferee® video judging system has been tested and used for years in several sports. The system is already in use successfully in major sports leagues all around the world (e.g. : Ice-Hockey, Canoe Slalom, Basketball, Volleyball). Clear-Com®, a leader in real-time communications solutions, was chosen as a Communications Technology Supporter for television relay service of China’s 2016 Great Wall Marathon race, which saw thousands of athletes take on 28.1 miles (45.195 kilometers) of the legendary landmark on October 16, 2016. Coverage of the Great Wall Marathon was streamed live to the world by the Chinese media company Sina. To help cover this unique sporting event, Clear-Com supplied an Eclipse HX digital intercom matrix to connect the production team. Via the IVC-32-HX frame card, Clear-Com’s Agent-IC app for iOS devices were deployed for the production team to use on site via their Apple® smartphones. Thomas Pagès is one of those rare examples of riders who are determined to take FMX (Freestyle Motocross) to the next level. The super-talented Frenchman has gone from practising in his own back yard, to competing with the best riders in the world, to progressing the sport time and again through his series of never-been-done tricks. In December 2016 XD motion produced a video about Tom Pages showing 10 FMX tricks with his motocross machine. The shooting was done for RED BULL during four days with the X fly 1D high speed wirecam for the tricks and a Hexacam drone for the opening shots. the camera was a RED 4K 120f/s with a 17/120mm Cabrio lens. Philips Lighting announced that its stage lighting will be used in the next leg of Justin Bieber's rapturously received 'Purpose' 2016 world tour. Lighting designer Cory FitzGerald has declared the multi-functional Philips Vari-Lite VL4000 BeamWash luminaire as essential for the redesigned 2017 leg. "There's going to be a few changes when the tour continues next year as we will be heading to outdoor venues and stadiums," said lighting director Nick van Nostrand, who is in charge of realizing FitzGerald's design out on the road. "The show is going to be reworked and we are currently making decisions on what's going to come with us. Cory has stated that the Philips VL4000 BeamWashes are high up on the list. There's not anything else out there that's a good substitute for all the roles it performs in the show." Innovative and cutting edge French artist / music producer DJ Snake rocked the Paris Zenith with an incendiary set and a spectacular new visual design by Romain Pissenem of creative production company High Scream … utilizing a lighting rig of nearly 200 Robe moving lights including 64 of the new Spiider LED wash beams, 80 x Spikies, 32 x Pointes and 11 x BMFL WashBeams. Lighting was programmed and directed by UK based Rob Lister who has worked as DJ Snake’s LD for the last year and has a long-standing working relationship with Romain and High Scream from visiting Ushuaia Ibiza with DJs Axwell & Ingrosso … for which Romain is also the production / show director. Emma Marrone's Adesso Tour 2016 stopped off at all the major sports halls on the Italian peninsula, along with a dynamic stage installation and an interesting lighting rig put together by lighting designer Mamo Pozzoli. The Claypaky A.leda B Eye K20s were most impressive and stole the show with stunning features. They are top performance wash lights, breathtaking beam lights, and spectacular, original visual effects generators. Their unparalleled versatility makes them an extremely interesting creative tool for all lighting designers. “I used the A.leda B Eye K20 massively. Let's say they played one of the leading roles in the effects during the show," which was entirely produced by Emma together with Luca Mattioni. Part of a large-scale technical modernization project, Austria’s ORF is equipping all of its nine regional broadcast centers with new TV broadcast workplaces. The move sees the federally organized, nation-wide public broadcaster placing a selection of Lawo audio and video equipment at the heart of its operation. All of the new workplaces are identical, and will use Lawo mc²66 mixing consoles, DALLIS-IOs, and V__pro8 video processors. Key to the renewal are two identically constructed Lawo container broadcast control rooms – these can be docked to the broadcast houses during the modernization to allow production to continue uninterrupted throughout the works. Manchester City Football Club has integrated a solution featuring Blackmagic Design infrastructure products to handle all aspects of video production across its Academy Stadium, which is located at its elite training and youth development facility, the City Football Academy. As well as delivering big screen content during the club’s Under 21, Under 23 and Women’s Super League fixtures, the system, built around four Blackmagic Studio Cameras, ATEM 1 M/E Production Studio 4K and Smart Videohub 40x40, is also the main production hub for streaming matches via Facebook Live. The solution, which was delivered by Timeline TV, produces two mixes during games; one which is fed to the stadium’s 15m2 jumbo screen and through to broadcasters, and one for the club’s streaming channels. The Nokia OZO is widely recognized as one of the most popular cameras for filming 360º VR content, and one of the few available on the market that does it well. However, one of its biggest drawbacks is that there is no simple way to monitor what’s being shot, forcing production crews to record blindly until the filming is finished. And when you’ve got clients and producers breathing down your neck, monitoring is an asset you’ll want to have at your disposal. Luckily there’s a very simple solution to this problem: the Teradek Sphere. Teradek’s Sphere is a 360º live-monitoring and streaming device that allows anyone with an iPad or iPhone to view 360º footage in real-time. The free iOS app acts as a command and control interface for the Sphere hardware. TVN is strongly expanding its UHD capacities: the film and TV production company from Hannover is upgrading one of its existing OB trucks with further Sony UHD equipment. 12 UHD HDC-4300 live camera systems, two CineAlta PMW-F55 cameras, the XVS-8000 video switcher and PWS-4500 the production server system were recently integrated. The 4K equipment has already successfully completed the UHD first broadcasts of football matches for German television. The TV service provider plans to increase its mobile 4K capacities further in 2017. Already since its foundation in 1984, TVN relies on broadcast equipment by Sony Professional. Megahertz Ltd, a trusted partner for systems integration with years of experience in delivering cost effective, imaginative designs and solutions for fixed and mobile applications, announced that it has upgraded Anglia Ruskin University’s SD television studio and gallery to HD, with provision for a future move to 4K. Anglia Ruskin University brought Megahertz onboard as the systems integrator to provide consultation services including equipment selection advice with a focus on interoperability across multi-vendor systems and implementation of a UHD workflow. Megahertz went on to design, install and commission the studio upgrade. The powerful Wings Engine RAW media server is the only server of its type capable of playing out 4 simultaneous streams of uncompressed 4K content at 60fps, which has made it household name in different branches of the AV industry in record time. RAW servers can also display video content using a full 12-bit colour space, delivering more colour information than the current media server standard. The render engine allows for the use of high frame rate footage of up to 120fps and makes it possible to create seamless 8K softedge blending panoramas.esent 8K media server at ISE2017.